It is a very contagious spreading inflammation of the skin, due to entrance of some poison through a wound or scratch into the system. It is accompanied with fever, chill, glandular swelling, constitutional disturbances, exhaustion, headache, dizziness, nausea, thirst, delirium, coma, vivid redness of the part etc. and local stinging or burning sensation. The local condition of the skin is one of heat, swelling and appearance of small pimple-like eruptions, or blisters. The danger to life is in proportion to the proximity of the affected part to the brain and to the extent to body-surface involved. It is supposed that under its influence ulcers are healed up and tumours disappear. Belladonna 1—3—Skin is slightly swollen, bright red and dry; face is the part mostly involved; much local heat; pupils dilated; headache. Rhus Tox 6—Bright red vesicles on neck, face or other parts of the body, with swelling and restlessness; pain all over the body. Apis Mel. 3—6—Much swelling with bruised sore pain, burning and stinging, very sensitive to touch; red, sometimes rosy hue. Arsenic 6-30—Boils are full of pus or blackish fluid; exhaustion; restlessness; much thirst. China 1x—In the acute stage of mild type of erysipelas. Apium Virus 6—Swelling with stinging sensation. Crotalus 6—If gangrene has set in. Aconite 1—Useful when the part is slimy, inflamed and no eruptions have come out. Cantharis 6—If the affected parts weeps and smarts. Ars. 6 or Carbo Veg. 6—If eruptions threaten to suppurate. Lachesis 6—If gangrene has set in. Pulsatilla 6—If boils disappear at one part and reappear at another. 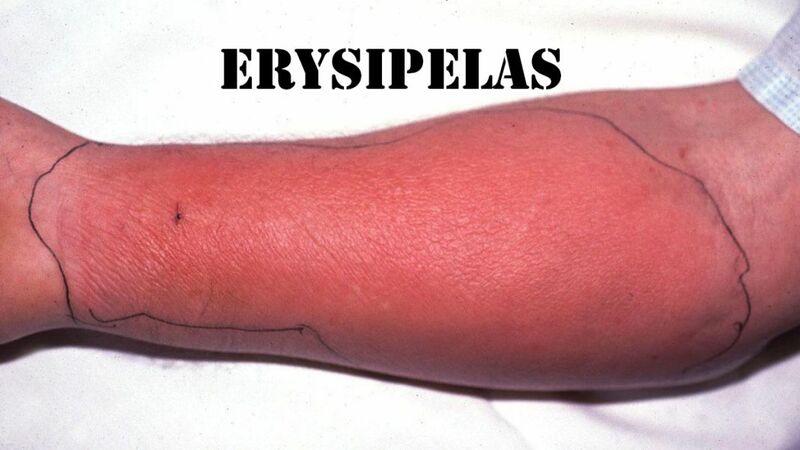 Butter-milk, if locally applied, heals Erysipelas.